As part of the Seven Questions Seven Promises team I focus on delivering very pure* EOS installations. I facilitate the EOS tools and days as Gino taught me. My clients graduate! Graduation means they have mastered the EOS material, and mastery means they can teach it and use it as if they created it themselves. I am often criticized by my peers because I don’t milk my client engagements for longer periods. I ask: “Why should I! ?” If I focus on teaching the material purely and teach the “why” beneath the material, and, don’t become a crutch, then my clients will master the material faster, gain confidence and they will graduate as masters! 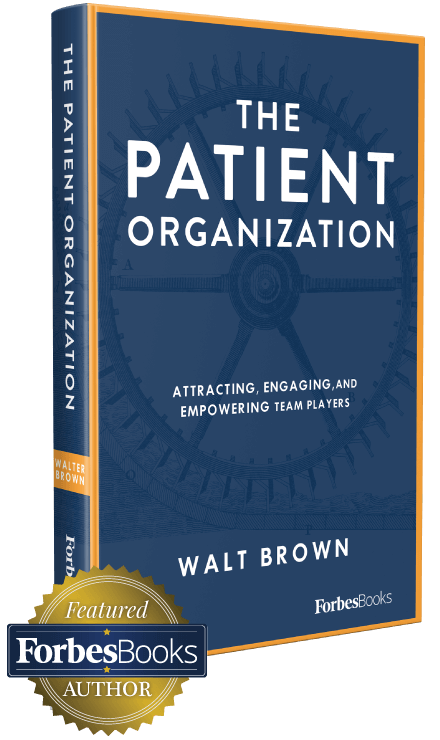 The “Why” beneath the EOS material is captured in my book The Patient Organization, it holds the 7 keys to unlocking the power inside your Organizational Operating System (OOS). Weather it is Rockefeller Habits, Scaling Up, Holocracy, The Advantage, 4DX, Traction, EOS®, or a self-developed system. It will answer why does EOS work? Why does Traction work? Why does Scaling Up work? and how does EOS work? how does Traction work, and how does Scaling Up work etc. etc.? Listen to Chapter 5: Do I Belong? The kind of freedom that comes when you enjoy engaged leaders, happy employees, robust cash flow and dependable predictable profit. Your company will not be a practice run. Join business owners for free lunch with me to learn how EOS® gives your business freedom. You will leave knowing if you want to book a 90-minute meeting for your leadership team. Have your leadership team join me for a 90-minute meeting to help you decide whether you are ready to move forward with EOS®. There’s no obligation, I love doing it, and it’s free!